Camp Musubi, a Japanese American heritage camp for middle-school youth, will host its 12th annual camp on July 14-18 in Los Angeles’ Little Tokyo. 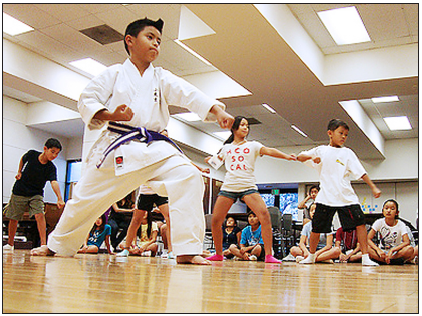 The day camp runs from Monday through Friday from 9 a.m. to 4 p.m. at the Japanese American Cultural and Community Center (JACCC). Extended care until 5:30 p.m. is available. Learning martial arts at Camp Musubi. “We are pleased to be able to bring this year’s camp back to the heart of Little Tokyo and renew our relationship with the JACCC,” said Jeff Murakami, chair of the Camp Musubi development committee. Camp Musubi offers fun and educational activities that explore the Japanese American experience and identity. Culture, community and history are some of the themes touched upon throughout the camp. The camp is staffed by Director Tony Osumi, a certificated LAUSD teacher and college-aged counselors. The camp is a product of conversations stemming from “Ties That Bind” conferences and continuing meetings about cultural preservation and leadership development. A number of community organizations participate as co-sponsors and form the Camp Musubi Development Committee, including Centenary United Methodist Church, Kizuna, Japanese American Citizens League – Pacific Southwest District, JACCC, Little Tokyo Historical Society, Little Tokyo Service Center, and Nikkei for Civil Rights and Redress. Registration for the camp is $290 on or before May 16 with discounts available for siblings and/or JACCC membership. To register or for more information, visit www.campmusubi.org. Additional questions can be directed to [email protected] or (213) 628-2725, ext. 107.